Hello! I was inspired by this weeks Papertrey Ink Make It Monday and created a card using the "double backgrounds" technique. I chose the Sheet Music bg, and Text bg set to create my background. 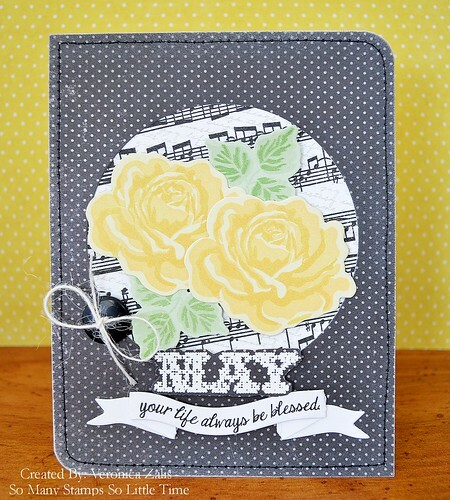 I used The Sweet Life, and Stitched Sentiments to create my flowers and sentiment. I hope you like my card! I'm happy you stopped by and I hope you have a great day! It's beautiful. It could be a wedding card, birthday, or really anything. Love those yellow roses against the grey! Lovely card! Love the layout and the colours, but the background, with its tilted music/text is really unique and interesting! !